Review: Caustic satire lives in "The Death of Stalin"
As high-ranking Kremlin officials conduct purges to shore up the government of Joseph Stalin, an unexpected crisis – namely, the passing of the head of state – leads to in-fighting, backstabbing and paranoia among cabinet members over control of the very bloody apparatus used to maintain one's own position. 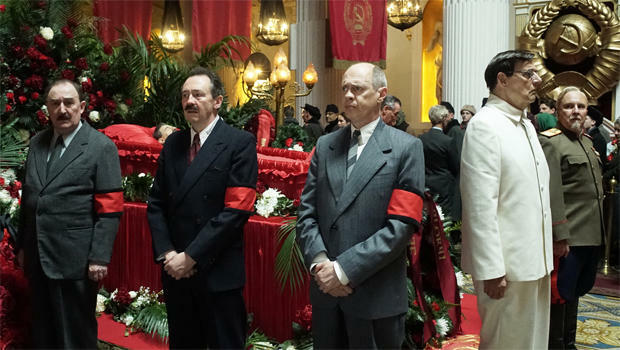 Directed and co-written by Armando Iannucci (the creator of "Veep" and the director and co-writer of "In the Loop"), "The Death of Stalin" is a hilarious take on when fear becomes the driving force behind society. At the height of the Cold War, if there is anything that the USSR is effective at producing, it is lists of "dangerous" persons who would be rounded up and shot. The Communist government's industrialized machine of political cleansing creates an undercurrent beneath nearly every single human interaction. Language becomes a tool to deflect responsibility and suspicion, and relationships become as transient as a change in the political wind. We see how shaken to the core by fear even the lower echelons of society are when, in the opening scenes, the engineers behind a live radio broadcast of a classical concert are informed that Stalin himself would like a disc of the performance. No one had thought to switch on the recorder. On less drastic errors have heads rolled. When news of Stalin's collapse circulates, we are introduced to members of his inner circle, including Lavrenti Beria (Simon Russell Beale), head of the secret police; Nikita Khrushchev (Steve Buscemi), the minister of agriculture, a schemer wary of every other schemer; foreign minister Molotov (Michael Palin), a rigid backer of the party line; and Georgy Malenkov (Jeffrey Tambor), Stalin's number two, who is foisted into the top spot by Beria as a means of protecting his own role in the new government. As the Kremlin arranges for a state funeral (and kills any witnesses to the premier's unheroic demise), Beria operates like a chessmaster to build public and private support, to fend off a mutiny from the ranks. A possible hazard is Field Marshall Zhukov (Jason Isaacs), whose Army would be vital in maintaining power, or dangerous in staging a coup. Comedy this black is notoriously difficult to pull off effectively while maintaining something akin to empathy for your characters. "The Death of Stalin" does this exceedingly well, with dialogue that is razor-sharp and performances that deftly tread the fine line between humor and horror. The cast is uniformly excellent, including Andrea Riseborough as Stalin's daughter, Svetlana, and Rupert Friend as her unstable brother, Vasily, who looks upon the occasion of his father's funeral as a way to address numerous grievances. It's a testament to his naiveté, given that grievances in Russia in 1953 are usually treated much more bloodily. But special praise must go to Beale. A three-time Olivier Award-winner best known for his stage work, and a leading interpreter of Shakespeare, his Beria is wonderfully ruthless, cajoling, caustic, and coolly inhumane. Richard III himself would be impressed. The sardonic humor persists through the closing titles, which evoke a tradition of Soviet re-writing of history by erasing figures from photographs. The blank spaces shout multitudes. "The Death of Stalin" (distributed by IFC Films) opens in theatres Friday. 107 mins. Rated R (because enemies of the state are definitely not treated kindly). To watch a trailer for "The Death of Stalin" click on the video player below.